For the second week running Wigan produced an outstanding attacking performance creating numerous chances but ultimately failing to take all three points. Both sides made changes from their previous line ups with Franco Di Santo replacing the injured Hugo Rodallega and Shaun Maloney starting ahead of Jordi Gomez for the Latics. West Brom were missing the injured Peter Odemwingie and the suspended Jonas Olssen and the ex -Wiganer Paul Scharner was also making a rare start for the Baggies. Wigan started the game in ferocious fashion creating three great opportunities for Franco Di Santo in the opening five minutes. By the law of averages the Argentinian striker should have netted at least one of them. Wigan were producing some excellent football with great combination play in the Albion half. Jean Beausejour put over some telling crosses but the Wigan attackers just couldn’t convert. The chances were coming thick and fast. Beausejour’s cross from the left reached the far post, where Emmerson Boyce headed firmly against the cross bar. James McCarthy also struck the cross bar from 20 yards and from the consequent rebound Ben Foster saved from Victor Moses. Wigan went in at half time wondering how they had contrived not to be in the lead. But early in the second half they took a deserved lead. Moses produced some excellent work by beating his defender and cutting the ball back from the by line and James McArthur bundled the ball over the line. However the lead did not last long as Wigan sat back on the lead and after conceding consecutive corners Albion drew level when Chris Brunt’s corner was headed in by Paul Scharner at the far post. Joseph Mulumbu should probably have been sent off for an ugly incident with James McArthur, but bizarrely referee Oliver only booked Malumbu, as well as Boyce and Thomas. Wigan were desperate to get the winner and they continued to pound the Albion goal. Mohammed Diamé shot wide, Graham Dorrans denied Beausejour and Foster saved well from Gareth McAuley’s deflection. Once again Wigan were unable to make their dominance count. Chance after chance had gone begging. As the players left the pitch, drizzle turned to heavy rain and soaked the despondent Latics faithful as they trudged away from the stadium. 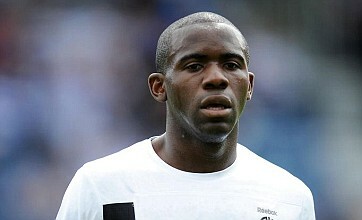 But as the fans made their way home news started to emerge of a shocking incident at White Hart Lane as Bolton’s Fabrice Muamba had collapsed with a cardiac arrest. The Bolton midfielder was critically ill and fighting for his life. Sometimes there are more important things in life than worrying about your football team. This entry was posted in Fabrice Muamba, James McArthur, Paul Scharner, WBA, Wigan Athletic and tagged Fabrice Muamba, James McArthur, Paul Scharner, West Bromwich Albion, Wigan Athletic. Bookmark the permalink.